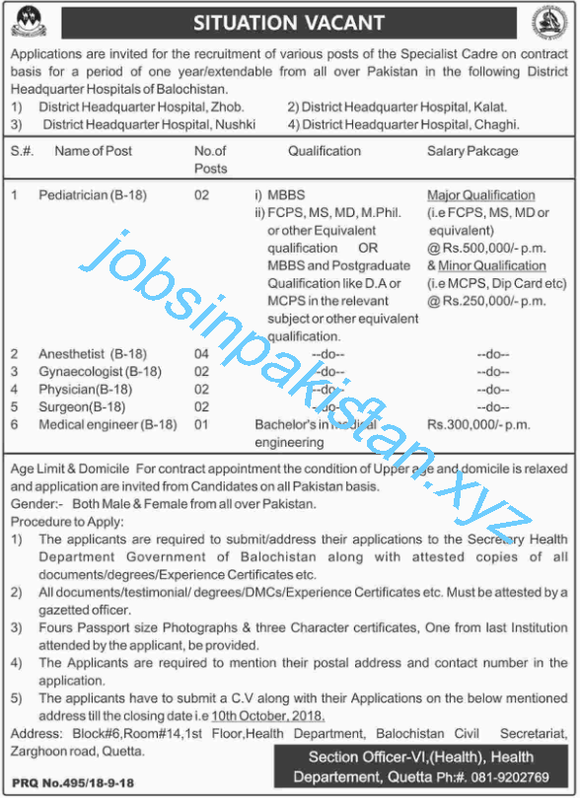 DHQ Hospital Jobs 2018 is listed below on our site. The advertisement for DHQ Hospital Jobs 2018 is come on today newspaper dawn. Applications are invited from all over the Pakistan for DHQ Hospital Jobs 2018. The applicants are submit their applications to the Secretary Health Department Government of Balochistan along with their attested copies C.Vs and Important Documents. Also send four passport size photographs and three character certificates along with C.Vs. The last date for submitting of form for DHQ Hospital Jobs 2018 is 10 October 2018. DHQ (District Headquarters) Hospital Balochistan require a applications for following empty jobs.